Obama | poemless. a slap in the face of public taste. LQD: “Rethinking Russia” by Stephen Cohen. By now most of you who will read anything I write will have read this. But I’m reposting for several reasons: 1) In the vain hope that my American friends, family, etc. who are not interested in Russia will read it, 2) Because it appears a few people in Russia -like, actual Russians and not smug expats- read this blog, and I want them to know that some Americans have sane takes in U.S.-Russia relations, and 3) I’m in love with Stephen Cohen. And his wife. It’s not completely accurate to suggest he says anything terribly new in this interview. He’s not only re-thinking, but re-peating. But let us forgo the easy standards of blogland and learn to value wisdom over novelty. I do recommend you read the whole thing. But it is 11 pages long. Below are just the parts I really appreciated. From an Interview with Stephen F. Cohen, Professor of Russian Studies and History at New York University and Professor of Politics Emeritus at Princeton University. Journal of International Affairs. Spring/Summer 2010. Reprinted by, Russia Other Points fo View. Cohen: […] Under Gorbachev, modernization therefore meant both political and economic modernization. After the Soviet Union ended in 1991, Yeltsin continued Gorbachev’s democratization in some respects but his policies resulted in the beginning of Russia’s de-democratization, which in the United States is usually, and incorrectly, attributed to his successor, Putin. The way Yeltsin abolished the Soviet Union, like a thief in the night, was not constitutional or democratic. There was no referendum on it. If you want to create democracy, you do not abolish the only state and homeland most people had ever known with the stroke of a pen, without consulting them. Yeltsin could have done what Gorbachev had done in March 1991 hold a referendum on the Union. Yeltsin might have won it, ending the Soviet Union consensually and without the widespread bitterness that remains today, and the 15 republics would have gone their own ways. Then, in October 1993, Yeltsin used tanks to abolish a parliament popularly elected in 1990 when Russia was still part of the Soviet Union. This too was a Russian tradition the destruction of a legislature in a nation with a long history of overwhelming executive power but without a tradition of strong, independent legislatures. Russia has a parliament today, the Duma, but it is neither. Cohen: The main obstacle to democratization in Russia is not contrary to American political and media opinion Vladimir Putin or the KGB, or any single leader or institution. It’s the way the nation’s most valuable state economic and financial assets were “privatized” between 1991 and 1996. The idea of state or commonly owned property was not just a communist idea; it was a Russian idea, with origins long before 1917. The Soviet state property fell into the hands of a relatively small group of insiders not just the billionaires we call oligarchs and created an extremely wealthy class very quickly. The essence of democracy anywhere is a free representative parliament however badly it may work. You can’t have this without free elections, but the Russian elite that holds vast property and controls part of the political system will never permit free elections as long as it fears for its wealth. The United States, by supporting Yeltsin’s privatization policies, was deeply complicit in the way that property was acquired. The Clinton administration and outside advisers called it a transition to a market economy and cheered it, and Americans went to Russia to guide the process. They unknowingly created a kind of firewall against democracy. Thoughtful Russians understand this conflict between ill-gained property and the lack of democracy. Some have proposed solutions, such as a one time super tax on this property, which would go into pensions, healthcare, and education in order to create a new social contract. According to this proposal, the people would forgive the rich and acknowledge their property as legitimate, and then their resentments would diminish over time, making democratization again possible. Social justice is a profound Russian belief. Without it, there will be no Russian democracy. Cohen: They barely exist at high levels. From 1991 to 1994, they were perhaps the strongest faction in the Russian government due to the carry-over of Gorbachev’s westernism and the belief of Yeltsin’s political team that the United States was its true political partner and would provide generous financial assistance. Then came the calamities of the 1990s associated with shock therapy, which Russians thought had “Made in America” written on it not an unreasonable belief since they saw legions of American economists and other advisers encamped in Russia. I published a book, Failed Crusade, about the consequences of this ill-conceived U.S. policy and behavior. Germany does not want to be an American protégé. Germany is beholden to Moscow for reuniting it in 1990-91: It wasn’t the United States that made reunification possible, it was the Kremlin leader, Gorbachev. The economic relationship between Berlin and Moscow is strong and growing. Russia is providing some 40 percent of Germany’s energy. They are building new pipelines together, and neither liked Ukraine’s disruption of supplies through its existing pipelines. Indeed, it was Berlin that blocked Bush’s attempt to bring Ukraine into NATO. This emerging Moscow-Berlin relationship, verging on an alliance, is one of the most important new bilateral relationships in the world, and almost no one in this country is paying any attention to it. In fact, for Moscow, Berlin and Beijing its new Eurasian relationships are more important than Washington, though Washington seems not to have noticed. First, we assumed we could and should instruct Russia on how to create a market economy and democracy, which Washington and legions of American crusaders tried to do in the 1990s. The reality is that Russians themselves know how to do both. More eligible voters have voted in Russian presidential elections than vote in ours. 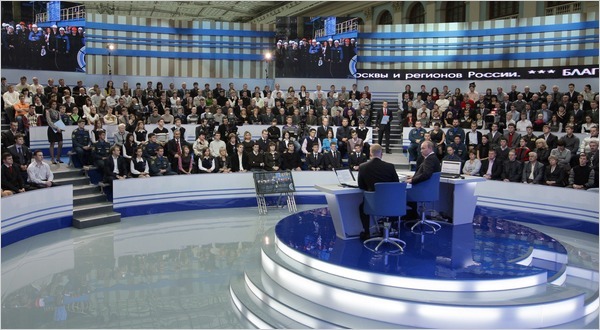 When Gorbachev began democratization in the late 1980s, Russians responded in enormous numbers and positively to the opportunity to participate in democracy not only to vote, but to attend debates and rallies, and argue as citizens. Furthermore, Russians have been buying and selling on the black and gray markets for decades, so they understand market economies. It was arrogance on our part, and the advice we gave was bad. Yet the notion persists it’s now called democracy promotion that every American president must actively throw his support to who we think are democrats in Russia. This not only creates hostility between America and Russia’s elites and people, but it is self-defeating. No good has ever come of it. The second conflict involves NATO expansion eastward, which was for Moscow a broken American promise. No matter what former U.S. officials now say, Gorbachev was told by Bush and Baker in 1990-91 that if he agreed to a reunified Germany in NATO, the alliance would not move, in Baker’s words, “one inch to the east.” When Clinton expanded NATO eastward, for Russia he had broken a solemn promise involving its national security. That was only the beginning. The triumphalist notion that, “we won the Cold War,” seemed to make Washington think it had the right to break any promise to Moscow. He then discusses the August 08 war and START. Which surely no one could actually have anymore to say about. Not here anyway. Cohen: They don’t want a pro-American regime in Iran. But they’ve grown increasingly weary of the current Iranian government, which has not kept its word to Moscow on several occasions. Moscow is just as worried about Iran’s nuclear intentions as we are. Indeed, Russia no less than us doesn’t want Iran to develop a nuclear capability, if only because Iran is much closer to Russia and would not need an inter-continental missile to threaten its territory. Moscow therefore has compelling reasons for not wanting a nuclear-armed Iran but it needs the United States to understand its different geopolitical circumstances. In particular, as Foreign Minister Sergei Lavrov repeatedly stresses, Russia, unlike the United States, is located at the crossroads of civilizations that are in an increasingly antagonistic relationship. Great diplomats begin by understanding the other side’s problems. I don’t recall a recent American president or secretary of state demonstrating this kind of awareness of Russia’s circumstances. Instead, they’ve told Moscow: “We have a problem and if you don’t help us solve it, you are behaving like the Cold War is not over.” When Russia doesn’t agree, we say they are still thinking in zero-sum terms. Again, this is really more a reflection of Washington’s stubborn inability to care about anyone else’s problems than Russia’s perceived stubborn inability to be cooperative. At the risk of repeating Cohen’s “double standard” grief, one must admit it is true: It is not only understandable, but commendable, heroic even, for Washington to act in American interests. For Russia to act in her own interests, however, is not only perplexing, but downright threatening. Cohen: […] The question is what the Obama administration and the strong pro-Ukraine lobby in Washington will do. Both Georgia, which will eventually restore relations with Moscow, and Ukraine are major defeats for long-standing U.S. policy. Will the proponents of the policy of expanding America’s sphere of influence now stand down or continue it, as they have in their words and deeds in connection with Georgia since the war? For the moment, their leading representatives, like Biden, Richard Holbrooke, and McCain are silent about Ukraine. Let’s hope they are re-thinking their follies. Ordinary Ukrainians and Georgians have only experienced more economic misery and political instability from these Washington projects in their countries. As for Kiev, I hope the Obama administration backs off and lets Yanukovych try to do what he can to help his people. My guess is that the Kremlin will see that its in its interest to help him in this respect with regard to energy prices, for example. Indeed, if Washington promises to never put military bases on Russia’s borders, and Russia in return promises to respect the political sovereignty of these former Soviet republics, the governments of Ukraine and Georgia could turn their attention and resources to the economic needs of their people instead of focusing on the military build-ups and political conflicts required to join NATO. Journal: Does … a shift in U.S. policy seem likely under the Obama Administration? Cohen: I’m not optimistic. Look at President Obama’s foreign policy team. Virtually every one of them comes from the Clinton era or the Clinton administration, which began this disastrous policy. As a senator, Biden was deeply involved in NATO expansion, and in both the Georgian and Ukrainian projects. Obama’s national security adviser, General James Jones, was head of NATO when it expanded. Michael McFaul, who heads the Russian section of the National Security Council, was a leading pro-democracy crusader in the 1990s. There is not a single dissenter, not one person who was in opposition to the policy in the 1990s who has a high-level foreign policy job in the Obama administration. I don’t see anyone near Obama who will or can tell him, “Mr. President, we need a new policy toward Russia, the clock is ticking, and only you, the president, can bring it about.” But it isn’t fair to blame Obama alone. No other American leader has proposed a new policy. For some reason, it was easier to get public and political attention for alternative policies when Russia called itself communist. People who used to blame communism for what they didn’t like about Russia now blame Russian tradition but the accusations are the same: Russia is inherently imperialistic, aggressive, autocratic and anti-democratic. This is false, and is even a kind of ethnic slur toward Russians. Russia’s political elite has much to answer for, but so do Washington policymakers. Some will say that I am anti-American or pro-Russian, as they have in the past. I have learned to disregard these comments as remnants of the McCarthy years. People like me, who claim to be knowledgeable intellectuals not shouting heads on cable television should not be like cooks preparing recipes for popular tastes. Our mission is to try to learn, understand, and speak the truth as best we can. Others will say, more kindly, that I am naïve about what kind of U.S.-Russian relationship is possible. But who would have predicted what Mikhail Gorbachev and Ronald Reagan accomplished in the 1980s, or that it would be so quickly lost? And you may say I only read this for self-serving reasons of confirmation bias and romantic ideas about how it is cool to be a Russia expert. To be honest, I do find him to be a little gloom and doom. Who wants to listen to such a depressive? And the whole idea that “The greatest threats to our national security still reside in Russia.” Really? I think they reside in Washington – but that’s just me. But just when I’m about to accuse dear Stephen of hysteria mongering, I realize that it’s just that he’s so passionate about it all. Easy to get worked up like that, especially when it seems no one will listen to you. You end up coming off as the town loony. I do it all the time. At least in Russia we might have the dignity of being Holy Fools. I also find his evolution as a Russia expert person a little surprising at first. I’m reading a collection of dissident samizdat he edited in the bad old days. He clearly felt an affinity, a passion then, for these Soviet dissidents, struggling for freedom of expression, democratization, etc. We’ve had a lot of discussion here about the modern dissidents in Russia, who also claim to be fighting these age-old wars with their leaders. But judging from the interview above, it would seem he’s left the camp. Instead of aligning himself with the victims of the current Russian government, he’s -whether he’d admit it or not- advocating on behalf of the Russian government itself. At least on behalf of their better angels. Maybe it’s not our hero who has changed, but the bad guy? As someone recently said, there are lots of serious problems facing Russia today, and whether or not to hang a picture of Stalin is not one of them. I don’t entirely relate to the bad old days Cohen because, frankly, I can’t get so worked up about Stalin. I can, however, get pretty worked up about the United States of America though. Being American, and not Russian, and all. Check it out: We’re the new dissidents. Apologies to Yulia.